Comprehensive Fee: The comprehensive fee, which includes tuition, room, board, and fees for all full-time undergraduate programs is $68,928. A year’s tuition allows students to register for three terms, taking three courses per trimester. This amount will be billed in three equal installments, payable on receipt of the bill for each term, in advance of the first day of classes. All full-time undergraduate students are expected to register for three courses per trimester. All continuing matriculated (full-time) students must register for at least three courses in every trimester prior to graduation. Additional Courses/Fourth Courses: Full-time undergraduate students who are required to pay for additional courses above the normal course load will be charged $4,056 per course. Refer to “Academic Policies, Fourth Courses ” for policies regarding enrollment for fourth courses. Part-time and non-degree course fees: All students in a part-time undergraduate program, both matriculated and non-degree, will be charged $6,091 per course. The charge to audit a course is $3,045. Dining Services: All full time undergraduate students are required to be on a meal plan. All first-year students are required to be on the 15-meal plan for the Fall and Winter trimesters. First-year students may also select the 12-meal plan for Spring trimester. Upperclass students may choose any of the meal plans offered. Students living off campus may elect the declining balance meal plan, which includes $200 per term, for a total of $600 per year and receive a rebate on their student bill equal to $1,658 per term, for a total of $4,973 per year. Students living off campus may also elect the 20 block meal plan in addition to the declining balance meal plan. The 20 block plan includes 20 meals plus $100 in declining balance dollars for an additional charge of $250. The students ID will also act as a declining balance card, which has the cardholder’s picture for identification and a magnetic strip to track the student’s cash and meal balance. Students wishing to purchase additional credit may do so in the Dining Service Office or online. The card is non-transferable and alterations or misuse can result in disciplinary action. Lost cards should be reported to the Campus Safety Office immediately. Replacement charges are $25. 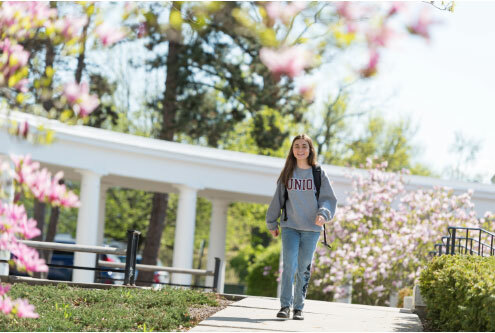 College Housing: Union is a residential college, and all students are expected to live on campus during the course of their undergraduate years, provided housing is available. Each year, prior to the spring housing lottery, the Office of Residence Life will publish guidelines for requesting permission to live off campus. Students living off campus will receive a rebate of $2,231 per term, for a total of $6,693 per year. Students who are married or who commute can be exempted from the on-campus requirement. (There are no housing facilities for married students.) Once the residence contract is signed, the student is bound to all College policies as outlined in this Academic Catalog, the College’s Student Handbook, and the terms and conditions of the residence hall contract. Students who withdrawal from a Term Abroad program are subject to a $600 penalty. $25 per term for students in College housing. Prospective students who would like to be considered for need-based financial aid must indicate on their admissions application their desire to apply for aid and submit both the Free Application for Federal Student Aid (FAFSA) and the CSS Profile by January 15. In addition, if the biological parents of the dependent student are separated or divorced, the noncustodial parent must also complete and submit the CSS Profile. Since family circumstances change from year to year, need is re-evaluated annually. Continuing students will receive a reminder via email from the Department of Education for the renewal of their FAFSA application. In addition, the Financial Aid office will provide detailed information on its web site regarding the renewal application process. Students and parents can view the status of their application through Financial Aid Self Service which is accessed from the Webadvising Student Menu. The deadline for continuing students is April 15. Once the completed aid application has been reviewed by the Financial Aid Office, the student will be notified via email to view their award online. In Self Service you are able to view financial aid award letters, keep track of application requirements and accept or reject student loans. Please note that all students are eligible to receive a maximum of 12 terms of financial assistance. Pell Grant: These grants, varying from $652 to $6,095, are awarded to the neediest students (based on a federal calculation). Federal Direct Unsubsidized Loan: Students who do not qualify for all or part of the need-based subsidized Direct Loan may qualify for an unsubsidized Direct loan. The interest rate is fixed and the interest begins at time of disbursement (or the student can choose to pay the interest while still in school). For dependent undergraduate students, the annual loan limits include amounts borrowed under a Federal Direct Subsidized Loan (i.e. first-year students $3,500; sophomores $4,500; juniors and seniors $5,500). Dependent undergraduates may borrow an additional $2,000. Undergraduates who are independent according to the federal guidelines or whose parents are ineligible for a Federal Direct PLUS Loan may borrow up to an additional $6,000 (for first-year students and sophomores) and $7,000 (for juniors and seniors). The current interest rate for Direct Loans is 5.05% with an origination fee of 1.066%. Eligibility for these loans is determined through the Free Application for Federal Student Aid (FAFSA) at www.fafsa.ed.gov. The Financial Aid Office notifies applicants the specific amounts for which they qualify from both the subsidized and unsubsidized loan programs. Repayment begins six months after completion of studies or leaving college and may extend up to ten years. Federal Direct Parent Loan for Undergraduate Students (PLUS): If creditworthy, parents of undergraduate students may be eligible to borrow up to the cost of attending Union (minus other financial aid accepted). The PLUS loan has a fixed interest rate of 7.6% effective July 1, 2017 and repayment begins 60 days after the funds are fully disbursed. The parent borrower does have the option to defer payments on the PLUS loan until the student’s six month grace period ends. PLUS loans are subject to a 4.26% origination fee. Information on the application process is available on our web site or from the Financial Aid Office. As a participant in the Yellow Ribbon program, qualified applicants must self-identify as Yellow Ribbon eligible on their admission application. Union College will fund up to four Yellow Ribbon awards. These awards are granted on a first-come, first served basis. Qualified Veterans will receive $31,618 in Union Scholarship, which when combined with the Veterans assistance, will cover the cost of tuition and fees. Please note that eligibility for Yellow Ribbon is limited to applicants who are eligible at the 100% level. New York offers a number of financial aid programs to residents. The Tuition Assistance Program (TAP) and Higher Education Opportunity Program (HEOP) are described below. In addition, the state offers other special programs for which details and application information are available at New York State Higher Education Services Corporation (HESC), 99 Washington Avenue, Albany, NY 12255.